Creative Earthscapes has already built several dozens of uniquely designed decks for residential and commercial property owners in the state. Our deck projects have made it possible for our clients to hold weekend barbecues, birthday parties, or outdoor dinners with their families and guests. So if you wish to have one of these landscape amenities built in your property, just dial (614) 322-3333, and let’s discuss details of the project. We serve Upper Arlington and surrounding areas, such as Columbus, Reynoldsburg, Lewis Center, and Grove City. For many of our past clients in Upper Arlington, our deck designs are truly exceptional in terms of beauty, functionality, and lasting quality. The same is how our clients from other cities feel about our excellent workmanship in the decks that we created for them. Among the designs that we offer include modern/contemporary (clean lines and sleek forms), colonial (characterized by classical American architectural designs), mountain (ideal for a log cabin setting), and coastal (perfect for a beachfront property). You can choose from any of these design options based on your heart’s desires. We can also do the choosing for you by carefully studying your property’s theme and then deciding on the deck design that would perfectly complement it. We also have permit-ready designs that you can choose from. This means that you could save time with a ready design, and we could immediately start with the project. It’s important to note that we source these materials only from suppliers that we trust. We also handpick each piece to ensure that every material that goes into our projects is guaranteed of highest quality. 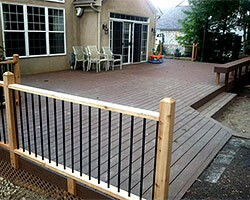 Aside from our permit-ready options, we also create personalized decks for those who want custom appeal. Aside from ensuring that the deck we will build you is visually pleasing, we will also ensure that it will be 100 percent functional. Aside from building it correctly, we will also offer you various options when it comes to added deck amenities. We can include tables, chairs, fire features (fire pit and fireplace), a pergola, an outdoor kitchen, sitting walls, pools, and the like. These add-ons will make the deck area more inviting. It will also allow for more activities that are fun, relaxing, and truly extraordinary. If you want to make your outdoors a better place to spend your free time at, then we strongly suggest having decks built. 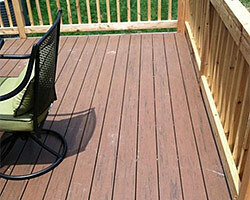 But not just any deck – it has to be made by experienced builders like us for assured quality workmanship. And with a limited five-year warranty with our deck creations, what else would worry you, right? Hire us today and let us build your dream outdoor amenities. Whether you are in Upper Arlington or residing in other Ohio city, Creative Earthscapes will always provide you with unique, functional, and stunning decks.